Double L's new TopJet Gravity Insulated Shutter design minimizes air leakage and seals up tight with no cracks or spaces for air to come through. Double L's patent pending design has louver blades made of 3/4" insulated board encased in fiberglass with an R-value of approximately 6. The counterweight louver blades are uniquely designed to open from the top, directing airflow up. 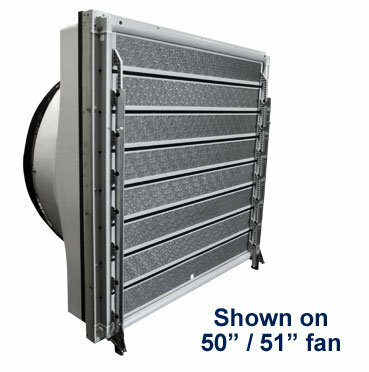 The design features of the TopJet Gravity Insulated Shutter allow for tremendous energy savings and because of its insulation value, it is unique to the livestock industry. Multiple infrared tests have shown a 20+ degree difference between the TopJet Gravity Insulated Shutter and the Standard Shutter - providing great energy savings, a safer environment for animals, and less buildup of moisture in buildings. When static pressure is created by ventilation fans, the TopJet Insulated Shutter blades automatically open to exhaust the air. When fans stop, the counterweight closes the louver blades. The TopJet Insulated Gravity Shutter is easy to assemble and install.